Out in the Meadow, the adorable little friends from Ten in the Den play a game of hide and seek. CJ loves the game of hide-seek and Ten in the Meadow is a great hit. The playful, rhyming text gives a good drive. Bear is IT, at the starting of the book he is found counting against a tree and the friends hide from the bear. Bear shouts 'here I come' and sets on his search. He finds his friends one at a time or two at a time. Once found, each friend joins Bear in the hunt for the others. The author gives environmental and wordy clues on who will be found next. For ex Fox and badger are found hiding in a Burrow, Bushy tails and little paws on the tree for Squirrel and Raccoon, Beaver is found hiding under the lily pads. By Sunset most of the friends are found except for the little mouse. Finally they find him fast asleep in the den. The author however shows the mouse on many pages, his sneak is shown clearly. Towards the end, when the ninth friend beaver is found, the mouse is tired and he yawns but he is unnoticed by his friends. The author gives a hint here for the children to guess where the little mouse can be. The beauty of the meadow is illustrated by adding Mushrooms, Flying bees, Bugs and Butterflies to the green background. The beautiful scenery of the Fox gloves, Daisies, Blue bells, Oak trees, Brook, Water Lilies makes us blend with the nature. Towards end of the book the sinking sun, twilit willow and twilight glow of the sky are depicted attractively. For the Book + activity, last winter we played hide and seek with our stuffed toy collection. The Day 16 Challenge of 30 days to hands on play was to "Go on a Hunt" and the challenge is from Jamie of Hands On : As We Grow. The hide and seek game was perfect fit for the challenge. This time we included some learning fun, we made a list of toys to hide and used the list for the hunt. Fun play along with writing and reading skills practice. Hide and Seek is so fun! Thanks for sharing and enjoy your week! 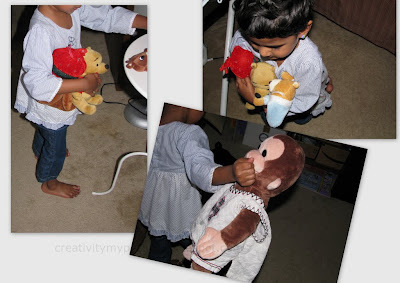 Placing stuffed animals in various areas in a controlled space may be fun for the children participating. Good post. We love playing hide and seek with our stuffed animals too!! !